“The Rage launch the ultimate assault on the Human Sphere. Their greatest weapons are the most fearsome creatures in the galaxy the Xenomorphs. Alien vs. Predator: Armageddon is the third and concluding novel in Tim Lebbon’s Rage War trilogy. Despite technically being an Alien vs. Predator series, each of the preceding novels went under the Predator and Alien title respectively, making the third novel the only one to officially be published under the Alien vs. Predator brand. This makes Armageddon the fourth book to be published under the Alien vs. Predator title and only the second not be adapted from an existing Dark Horse Comics series (though we don’t talk about Alien vs. Predator: Hunters Planet). With all the story set-up out of the way and all the main characters introduced in the previous novels, Alien vs. Predator: Armageddon forges on with the narrative. There are no wasted pages here. Lebbon drives us forward towards the big end and it’s a great ride. As I mentioned in the previous reviews, The Rage Wars feels nothing like the previous Alien or Predator novels. Lebbon has taken us far into the future where mankind isn’t struggling against the frontier. They aren’t taking baby steps anymore. It is a completely new feeling for the franchise. This is increasingly evident in Alien vs. Predator: Armageddon for two main reasons. Our main characters solution to the Rage revolves around the nanotechnology that Liliya has stolen from the Rage and how the conclusion of the trilogy has mankind returned to their fledging days of interstellar travel. The cover art for Alien vs. Predator: Armageddon. I did find the lead-up to the main characters plan to defeat the Rage to be a little unclear. The first time they talk about it, they have some vague ideas and then when it’s brought up again, they have a fully formulated plan and information they didn’t seem to have before. It’s almost as if there was a section of information cut out. It made complete sense when it came to the enactment of that plan and it worked 100% for the story. I just found that jump of information a little jarring. The direction Tim Lebbon took the universe at the conclusion of Alien vs. Predator: Armageddon slightly surprised me – mankind was absolutely crippled and returned to the kind of capabilities it had during the Alien films when the dropholes they use to navigate are shut down. I can completely understand the character motivation behind the shutdown and I loved the grimmer ending. Despite our character’s victory, they had still lost. It just seemed odd to me because it’s the third “reset” that has taken place within the Titan novels. Alien: Out of the Shadows was the first of a brand new continuity with no hang-ups from the previous novels. Alien: Sea of Sorrows put a lot of world building into resetting the post Alien-Resurrection timeframe into something more akin to Aliens. Then after having spent a trilogy developing mankind far beyond anything like the earlier timeframes, it’s reset again by the conclusion of the Alien vs. Predator: Armageddon. With the bulk of the character development done in the previous two novels and the driving force of Alien vs. Predator: Armageddon being the narrative, character moments are a little sparse. They’re not non-existence but they’re not as many as in the previous two entries. The Tanns have some lovely moments together and Isa Palant’s curiosity continues to bring some wonderful moments. As with Alien: Invasion, we get some characters whose purpose is just to show how the situation is further out within the Human Sphere and while necessary to develop the story, they do feel a little empty at times. In particular is the Colonial Marine commander in charge of Weaver’s World. Tim attempted to inject some development into him but I found it fell a little flat. He was more just there to push forward the story. I also struggled to find much interest in Marshall during Alien vs. Predator: Armageddon. He just seemed a little dull. I’m not sure what it was about Marshall’s presence in the story but something about him seemed off to me. Almost as if Tim was trying a bit too hard to push the angle that not everyone in Weyland-Yutani was evil. Liliya, though, continues to be an absolutely wonderful character and the real driving force of the Rage War. Whenever the book shifted to her perspective, I knew I would be happy. Her entire arc is one of my favourite aspects of the series and I loved everything she brought to the series. Her journey throughout the three novels was just wonderful and it was such a satisfying experience to read her grow and see where her journey took her. Like the original Aliens vs. 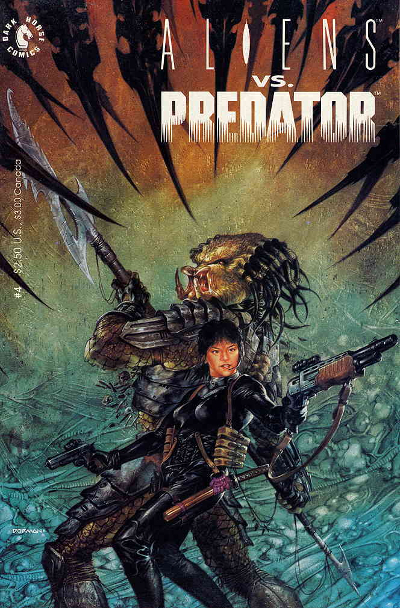 Predator comic and book, the alliance between mankind and Predators in the Rage War felt very natural. The issues I had with the Predators being underpowered in Predator: Incursion are gone by the time Alien: Invasion comes around and there are no such concerns with Alien vs. Predator: Armageddon. They’re an effective force and without their brief alliance mankind would have been in a far worse place. Fans like to groan at the team-up from Paul Anderson’s Alien vs. Predator but like the original Randy Stradley comic, the alliance in the Rage War (however brief it is going to be) just feels so natural. At no point in the series did it feel out of place or unnecessary. I really think Tim did a great job at making that alliance work so well. The interactions between the few primary Predator characters and our main human characters continued to be fun to read and their burgeoning relationship really has me eager to see a post-Rage War continuity. I really want to see where it goes. I did miss the emphasize on the difficulties that the human characters faced while communicating with the Predators but I can’t fault Tim for glazing over this as we’re at the point where we know how they’re capable of communication and it’s not really a vital part of the story at this point. It’s all about driving that story forward more. As I predicted in my Alien: Invasion review, the Faze’s importance is amplified tenfold. While Tim Lebbon isn’t explicit, it’s heavily implied that the Faze is in fact acting on behalf of another race known as the Drukathi to manipulate the Rage into crippling mankind. Whether the Drukathi are the dog-aliens introduced in Lebbon’s Alien: Out of the Shadows or actually the Engineers is unknown. The Predators are very aware and very wary of them though. This is yet another reason I’m eager to see some post-Rage War stories! In a time where we’re getting some cracking new novels and Dark Horse are putting out some gorgeous comics, please invest in some original cover artwork. It would be fantastic to see John Bolton, Dave Dorman, Raymond Swanland, Den Beauvais or Tristan Jone’s talent grace the covers of these new novels and really help attract attention! Titan, please bring back gorgeous painted artwork for your covers! 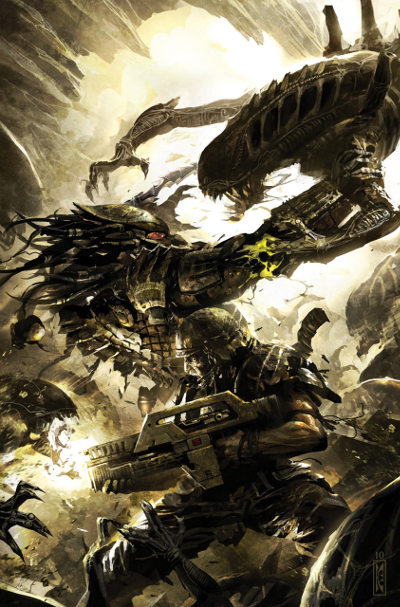 It would be great to see something like Raymond Swanland’s amazing cover artwork from Aliens. vs Predator: Three World War on the front of a book that said Titan on it. I’ve really enjoyed the entire Rage War trilogy. The militaristic, hard sci-fi approach that Tim Lebbon has taken really does help the series stand apart from the previous novels. It feels so completely different. This isn’t going to be something that everyone enjoys but I really appreciated the tonal shift. The series flowed nicely from one book to another, never feeling stalled or dull. I really look forward to seeing more of this universe in the upcoming Predator anthology series were Tim will be re-entering the Rage War world. From Corporal Hicks here at Alien vs. Predator Galaxy, I award Tim Lebbon’s Alien vs. 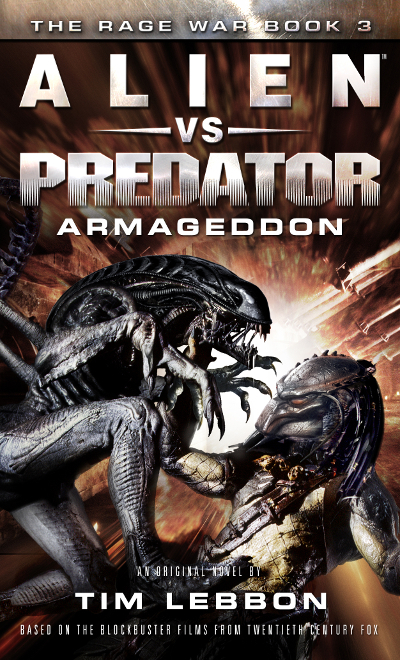 Predator: Armagedon (and the Rage War trilogy as a whole) with 7.2 out of 10!